If you are planning to build a custom log or timber frame home, then selecting windows is a critical decision. Windows are one of the most important design elements of your home. They should integrate with the home’s overall look and feel. The selection of windows will have a major impact on the energy efficiency and performance of the home. As a result, windows, the cost of which can vary greatly depending on quality and style, make up a significant percentage of your home’s cost. There are a number of styles and types of windows. Here are a few terms that might help you when researching windows. Aluminum Cladding refers to the covering on the exterior of a wood window unit. (Vinyl windows generally do not have cladding although some fiberglass and PVC windows may have cladding). The aluminum covers the entire exterior of the window, protecting the product from the outside elements and reducing the amount of maintenance required. Because aluminum cladding is available in a wide variety of colors, including custom color matching, it does not need to be painted. The aluminum used in cladding can be rolled or extruded aluminum. Extruded aluminum is heavier duty and generally performs better than rolled aluminum. 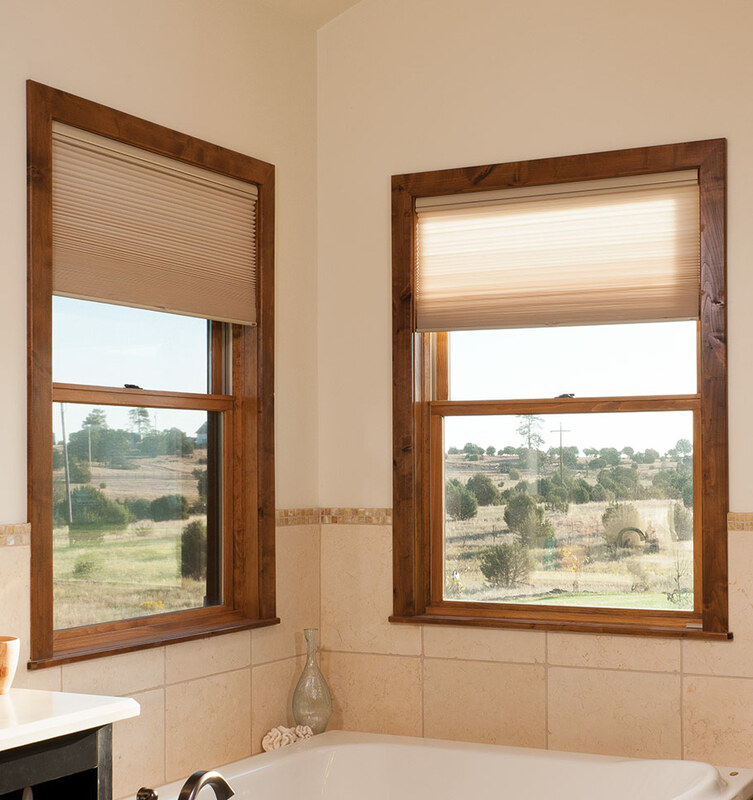 Awning windows have one hinged sash at the top that swings outward. Often placed above or below other windows and doors, awning windows offer additional ventilation. They open and close with the turn of one easy-to-reach handle located on the bottom of the window frame. Casement windows feature a hinged sash on one side that swings outward. They open and close with the turn of one easy-to-reach handle located on the bottom of the window frame. Double Hung windows have two operating sashes – one on the top that slides down, and one at the bottom that slides up. Because both sashes open, these windows offer great ventilation. They also have an EZ Tilt option which allows both sashes to tilt in from the top for easy cleaning. 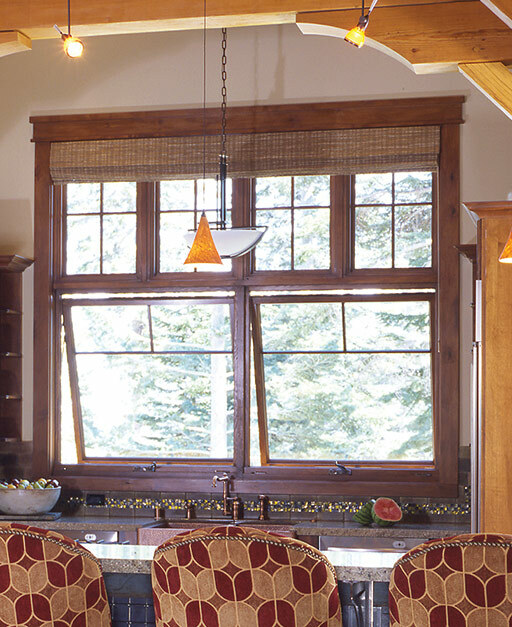 Single Hung windows have one operating sash on the bottom that moves up and down. The top sash does not operate. Glide By/Slider windows have one operating sash which moves side-to-side. The second sash does not operate. Glazing refers to the different glass options designed for various environmental conditions and home designs. Depending on the architectural design and performance requirements, the glass may be clear, tinted, obscure, Low-E, or a combination of these options. Windows are constructed of either wood or man-made products including vinyl, fiberglass, and PVC. Generally of higher quality, wood windows are more desirable from a design and aesthetic perspective, particularly when used in a log home or timber frame home. 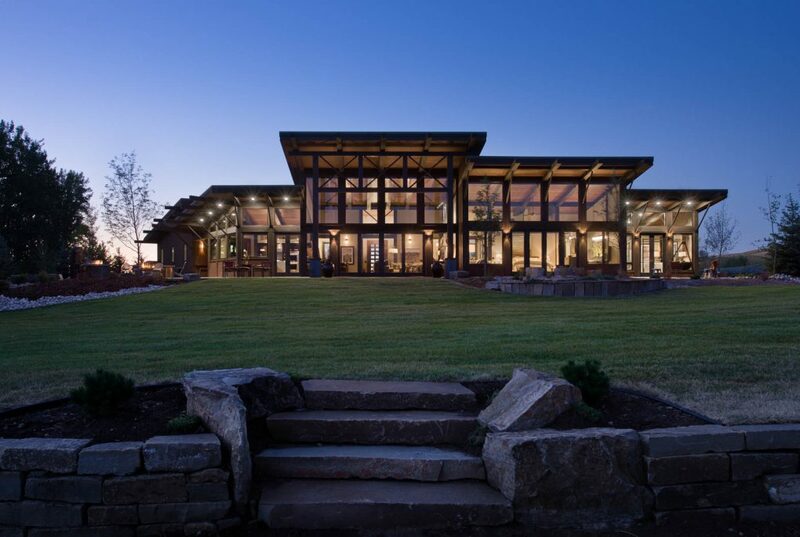 Most all of the homes designed by M.T.N Design and built by PrecisionCraft Log & Timber Homes use wood windows. Windows built with a wood exterior require priming and painting to protect them. Conversely, covering the wood with cladding offers protection as well (see aluminum cladding above). On the interior, the wood is stained or painted, depending on your preference. A variety of wood species and grades are used to manufacture wood windows, including clear select-pine, alder, or vertical grain fir. The United States has hundreds of window companies. It is important to select a company with a good reputation as well as high quality and competitively-priced products that include a comprehensive warranty. PrecisionCraft recommends Windsor Windows; however, the final decision is up to you. Windsor offers a very high quality and broad product selection, including extruded aluminum cladding, at competitive prices. Their warranty is complete and comprehensive covering the frame, sash, and glass over an extended period. Before you select your windows, talk to a design professional. Consider the aesthetic appeal of the window design, the energy performance qualities, materials used in the construction of the window, maintenance properties, and warranty offered by the window company. Thanks for these tips for picking out some windows for a log home. You mentioned that a double hung window could have two operating sashes. I’m interested to learn what situations would benefit from these windows, like if their function could add security.